Here are some contractor business cards that we’ve produced for some of our contractor clients. These are other than the ones we’ve specifically categorized such as the Plumbers and Carpet Cleaners business cards. When we have enough cards in a single industry, we will create a separate category for it. 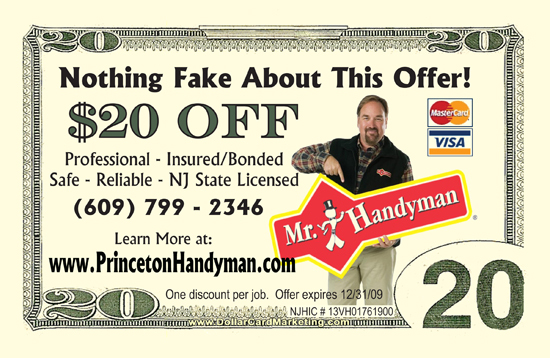 Here’s a set of $20 bill business cards that we created for a Mr. Handyman business in Princeton, NJ. These contractor business cards are also being used as a $20 coupon toward handyman work.